Making homemade pizza dough is not something I care to venture into just yet, but buying the premade pizza crust just costs too much. 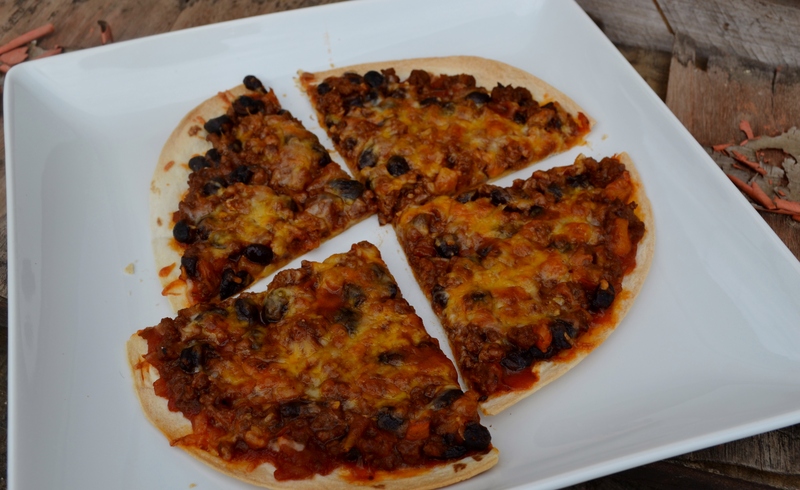 So while looking in my fridge I got the idea to use tortillas as the “pizza crust” for individual size pizzas for dinner. Here is how it all came together. Place your tortilla’s on a baking sheet. I line mine with foil for easy clean up. 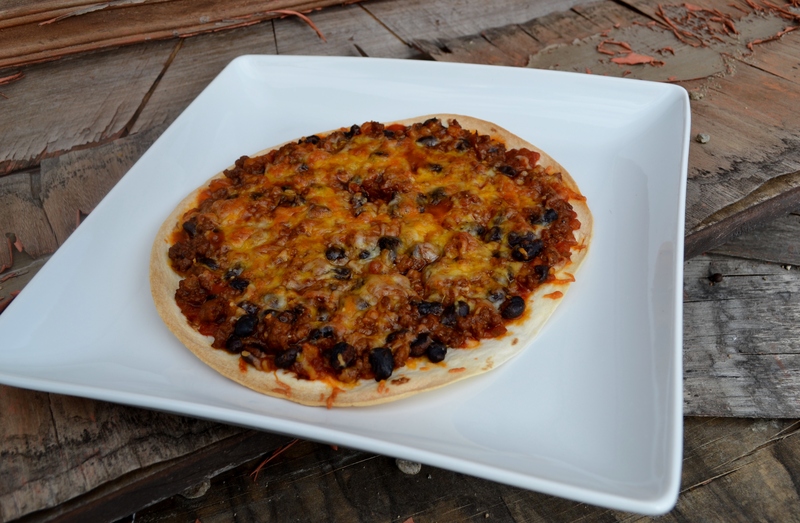 Spread a thin layer of your favorite salsa on the tortilla. If different people like different salsa in your household then it is really easy to accommodate it here. Jeff prefers the El Torito mild salsa. I prefer to breath fire. 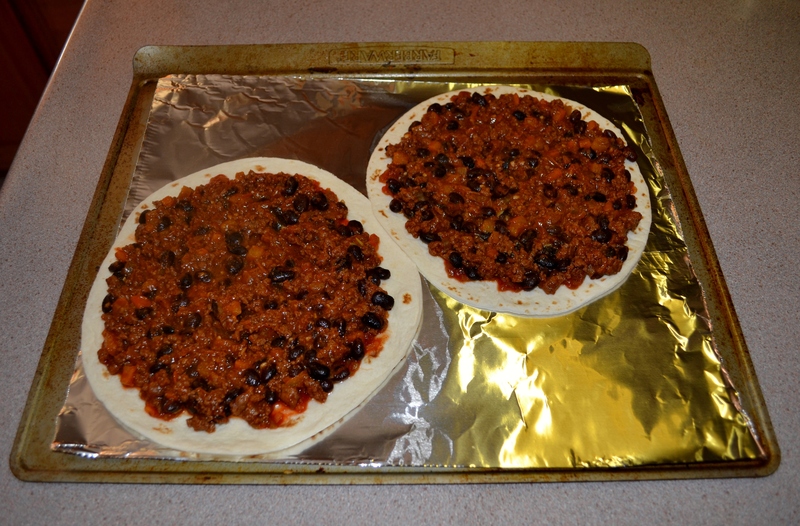 Then cook up the mexican topping (recipe at the bottom). Layer the Mexican topping right over the salsa. Be sure to leave a little bit of an edge for picking up the slices to eat. Top it with some cheese. 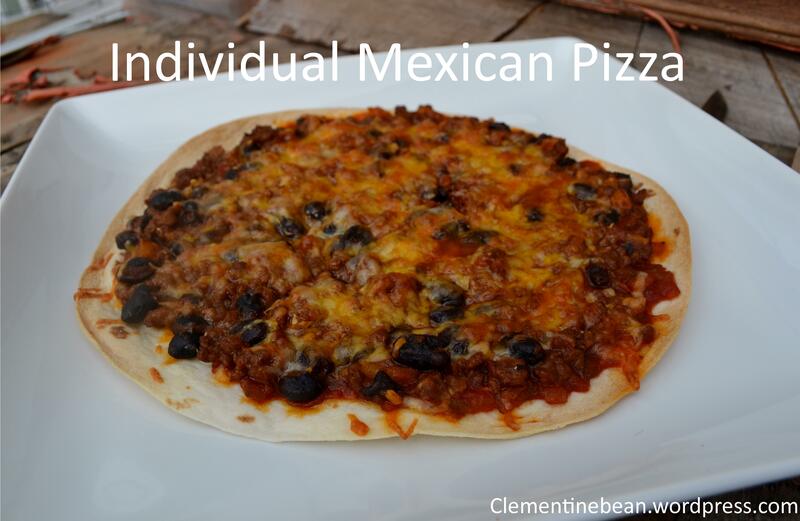 We use the 4 cheese Mexican blend. Pop these babies in the oven at 450° for ten minutes or until the cheese is bubbly and the crust is crispy. The possibilities are endless and easily customizable for different palettes! 1) Preheat the oven to 450°. Heat oil in a medium saucepan over medium heat. Add the onion and bell pepper and saute for 4-5 minutes, until starting to soften. Add the garlic and saute for another minute then add the beef and cook over medium high heat for 4-5 minutes, until browned all over. 2) Add the tomato paste and cook for 1 minute, stirring continuously. Stir in the water and beans and season to taste with salt and pepper. Cover and simmer for 15-20 minutes, stirring occasionally, until the meat is thoroughly cooked and the sauce is spreadable. Remove from the heat. 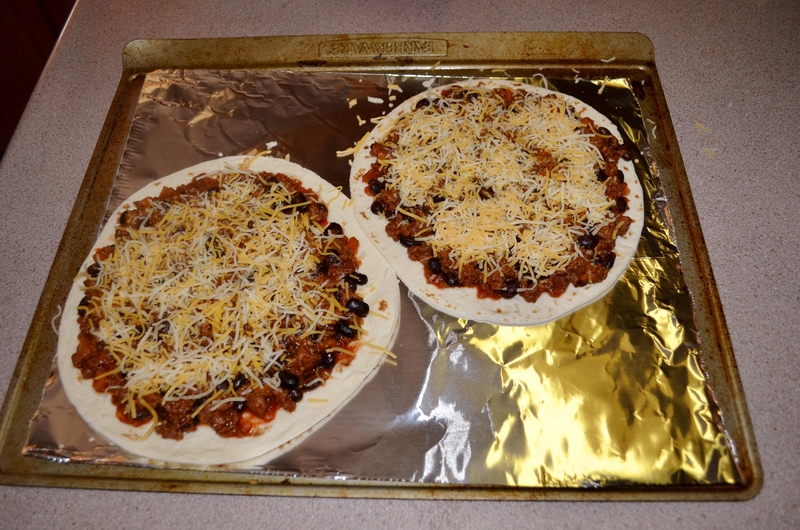 3) Place the tortillas on a lined baking sheet. Spread the salsa over the tortillas then top with the beef mixture. 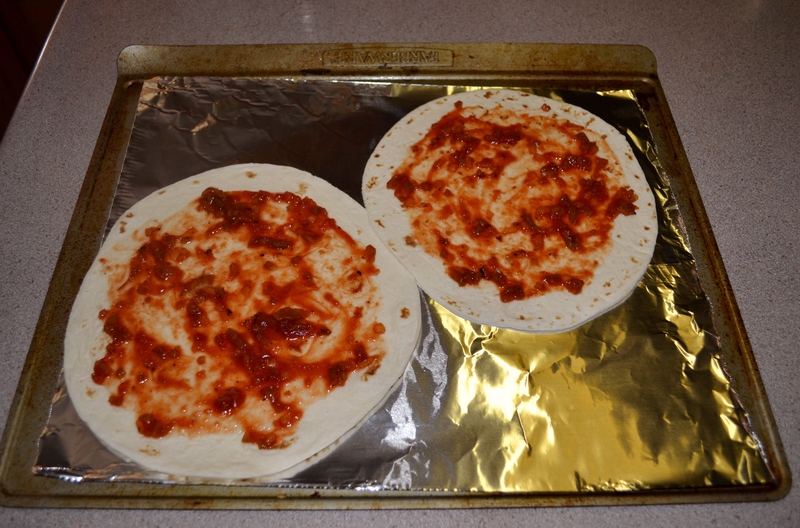 Scatter over the cheese and bake in the oven for 10 minutes, or until the cheese is melting and the tortilla is crispy. Garnish with fresh cilantro, guacamole, jalapenos, sour cream or hot sauce. 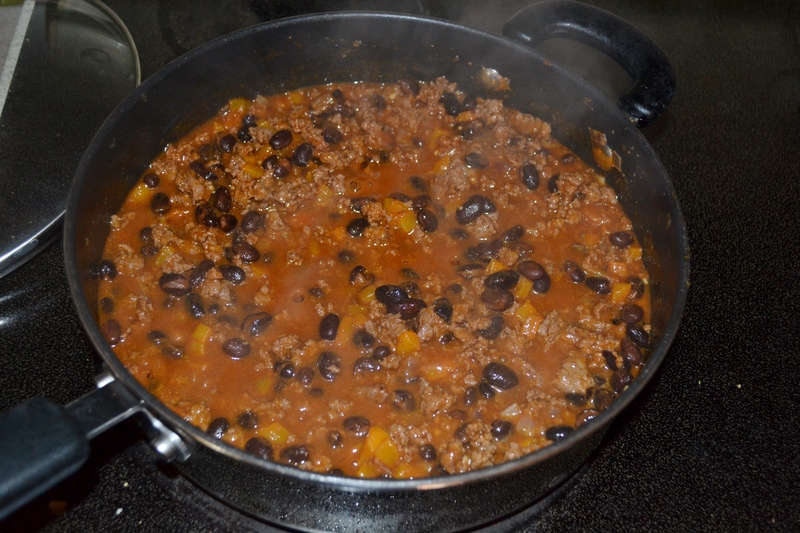 *If you like things really spicey add a chili or jalapeno to the beef mixture when sauteing the onion and bell pepper.